Importance of Casino Customer Service During Intensely Competitive Times Explored in Newsletter By Robinson & Associates, Inc.
Casino customer service and the importance of its role during these times of intense competition in the gaming industry is explored in this week’s edition of “Casino Customer Service Solutions, Tactics and More,” Robinson & Associates, Inc., announced today. Those interested in receiving this week’s edition and future issues should contact Robinson & Associates at lbaird(at)raresults(dot)com or call 208-991-2037. They also may subscribe to the newsletter by clicking here. “Casino Customer Service Solutions, Tactics and More” curates links to online articles, news releases, videos, graphics and more and presents them in a format that makes it easy for readers to review and then click for more information. About Robinson & Associates, Inc.
Martin R. Baird is a casino consultant and chief executive officer of Robinson & Associates, Inc. For 20 years, Robinson & Associates has been dedicated to helping casinos improve their guest service so they can compete and generate future growth and profitability. A Boise, Idaho-based casino consulting firm to the global gaming industry, Robinson & Associates is the world leader in casino guest experience measurement, management and improvement. Recently, it announced Simply Share, a real-time customer feedback platform that makes it fast and easy for casino customers to share their experience directly with casinos instead of posting comments online at social media sites. For more information, visit the company’s Web site at http://casinocustomerservice.com/train_areas.htm or contact Lydia Baird, director of business development, at 208-991-2037 or lbaird(at)raresults(dot)com. 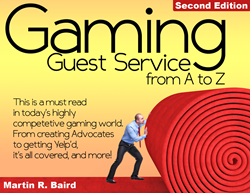 Read about a variety of topics at Martin Baird’s blog at http://casinocustomerservice.com/casino_news.htm/, including casino-related articles, casino customer service training, mystery shopping, casino reputation measurement, casino training, service gap analysis and more. Robinson & Associates is a member of the Casino Management Association and an associate member of the National Indian Gaming Association.